The following originally appeared on 10/29/08 at Exit 51. Jiggity jig. New York was a whirlwind. I managed to find all my destinations without getting lost. It helped that I really didn’t venture too far from Times Square. 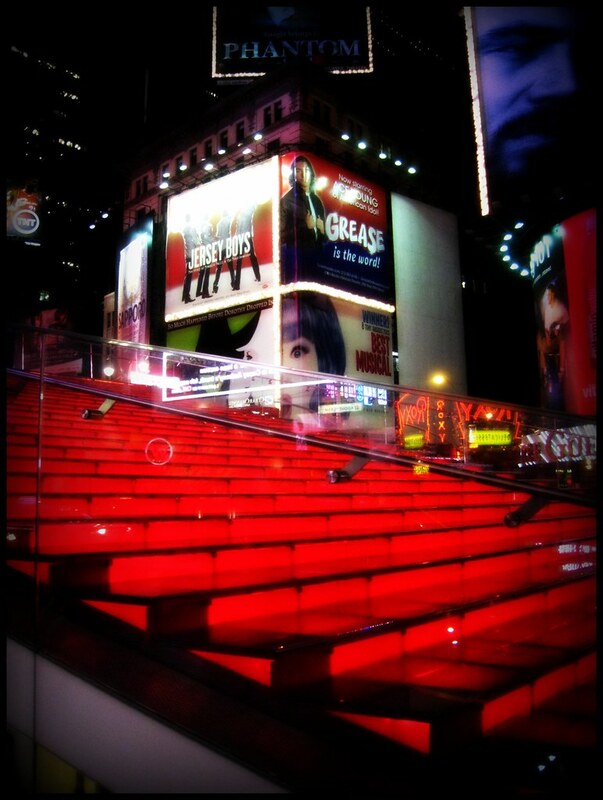 Like a homing pigeon, I could always find my way back to the red tkts steps. So I gave myself a gold star for that. Or rather, I gave myself a fabulous handbag. There’s no shortage of purses for sale on the streets. But this one lived in a hip boutique on W. 57th Street. It’s chic and very metropolitan. And I was destined to have it. It must have been destinty, because everything else I was interested in cost as much as a car. Seriously, those earrings at Tiffanys? The cheapest ones I liked were $2,300. The nice ones were $10,000. That’s almost a Hyundai, or maybe a Kia. And the ones at the store that lost their lease? Still $5,000. So in comparison, my Cleo & Patek was a steal. If you hurry, I bet you can grab one for yourself. And after you find a lovely handbag for yourself, you’ll want to get a bite to eat. You can do what I did and walk down to E. 28th and go to Blue Smoke. If you’re like me, you’ll get there an hour early for your dinner reservation. And if you’re as lucky as I was, they won’t make a fuss about seating you early. I had the fried chicken but you order what you like. It all looked good…especially those warmed barbeque chips that the next table over was snacking on. Some of the best meals I’ve ever had has been in New York. This trip added a new entry onto that list. Let’s just say that if you find yourself seated at a table in Bobby Van’s Steakhouse, the Chilean Sea Bass rocks. The fish, every moist and tender bite, was topped with a layer of carmelized miso. It bathed in a silky smooth, luxurious broth that I’m sure contained more than my recommended daily allowance of butter. After the fish was gone, it was all I could do not to slurp up every last drop of broth. It was THAT good. But NYC is a world unto itself. And while it’s a nice to place to visit, I’m glad I don’t live there. Sometimes the best part about being away is coming home and being in your own space. I haven’t been able to spend as much time in NYC as I would like. I definitely haven’t had enough great meals there as I should have in such a good food city. Gotta work on that! It is embarrassing how close NYC is by train to say that I don’t go there more. I find that it’s actually not as practical as I had hoped. But it’s still darn pretty.